Airplane accidents can happen anytime and anyplace. 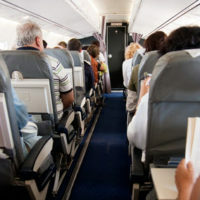 While airplane accidents are far less common than car accidents, the potential for death and injury can be devastating. Mechanical difficulties (for example, recall the “Miracle on the Hudson” plane that lost its engines after running into some birds). But airplane accidents aren’t the only cause of flight-related injuries, as two high-profile incidents that recently occurred on separate United Airlines flights demonstrate. On April 10, a 69-year-old passenger was violently dragged off a plane to make room for United employees. He was trying to fly from Chicago’s O’Hare Airport to his home in Louisville, Kentucky when the airline announced it would bump four passengers. After asking for volunteers, officials randomly selected four passengers. One of them refused to give up his seat, and security personnel literally dragged him off the plane. Airline and airport officials are investigating the incident. That same day a United Airlines passenger on a different flight was stung by a scorpion that fell out of an overhead bin.The passenger, who was flying from Houston to Calgary, Canada, says he was eating when something landed on his head. He picked it off, dropped it on his plate, and picked it up again. That’s when it stung him. Another passenger killed it. Medical personnel met the plane when it landed in Calgary. While these might seem like extreme examples of flight-related injuries, the fact that they happened demonstrate that something similar could happen to you. Even if an airline never again drags a passenger off a plane, other physical attacks are possible (by a crewmember or fellow passenger). It is also possible for scorpions and other bugs to stow away on flights, especially those that are departing or coming from exotic locations. When you are injured in an airplane accident or during an in-flight incident, it is not always readily apparent where you should file a personal injury lawsuit. There are likely multiple options, including where the airline is incorporated, where the airline does business, where the accident actually occurred and where you live. For example, if you are a Jacksonville resident who is injured on an airplane in Chicago, you could file your lawsuit in Chicago or in Jacksonville. Where to file the lawsuit depends on a multitude of factors, including each location’s statute of limitations (deadline for filing suit) and where the evidence is. While it’s nice to have options, that can also make your lawsuit more complicated. That’s why you should always consult with an experienced attorney. If you or a loved one has been injured in an airplane accident or in any incident onboard an airplane, you and your family might be entitled to compensation for your injuries. Contact a Jacksonville personal injury attorney at The Pendas Law Firm today for a free consultation. The Pendas Law Firm also represents clients in the Miami, Fort Lauderdale, Fort Myers, Tampa, Orlando, West Palm Beach, Dayton and Bradenton areas.